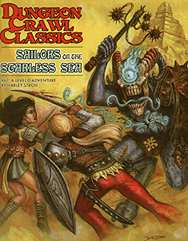 This is a great introductory module for this excellent new Old School rules system. The adventure is for a large party of Level 0 characters. Essentially you can get up and running in 10 minutes - initial character generation only takes a short while, as Level 0 characters are just a randomised set of statistics, into whom you breathe life - assuming they survive! I've DM'd this module through twice with two different sets of people - one resulted in a TPK, the other resulted in a fully finished adventure (albeit I was being a little kind to the party), with 8 out of 16 Level 0 characters surviving. That is a very good survival rate for a Level 0 party - most characters will die in the Level 0 "Funnel". At the end of this you will have some battle tested characters, whom you will hopefully have given some kind of personality to during the adventure - this is most likely to appeal to those who enjoy role playing as well as simple rule systems - ready to chose what character class they will adopt when they move up to the heady heights of Level 1.